This is an image from a project I did a couple of years ago with artist, Lonnie Graham. 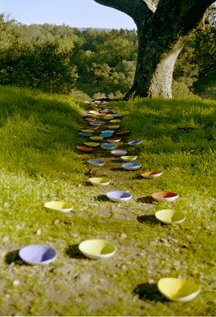 I made 200 bowls, which I packed up and took with me to conference in California at the Copia Institute. The bowls were given to the participants with 5 tastes in each - salty, sweet, piquant, sour and bitter. Before the panel spoke, Lonnie and I wandered out into Napa and found this location. Slowly, but maybe quickly, by historic standards, a new reality is taking shape. Monday, I got word that our own Chatham is embarking on a world class development. Solaqua, a 100,000 sq. ft. abandoned factory here, will be transformed over the next 3 - 5 years into a thriving arts community powered by solar, water and wind energy. Artspace, a Minneapolis based arts organization with 30 years experience revitalizing factories, warehouses and the like around the country gave the nod to our project. Artspace has the muscle to raise millions of dollars for the project and will also help work out the logistics to maintain affordable work spaces for artists. The Columbia Berkshire Craft Guild, an organization I am part of, will be one of the first tenants of the newly refurbished facility. Soalqua is a long time vision of the owner, Jody Rael, whose steadfast intention of turning the old mill into an arts space goes back a decade. Richard Florida, in his brilliant "Rise of the Creative Class" discusses how the creative people in any community give it its soul and its economic potential. A project like Solaqua, in a rural community like Chatham, 2 hours north of Mannhattan, will prove to be an amazing magnet, both here and further afield. It has already begun to galvanize the imagination of both artists and environmentalists alike, sparking energy to create a place that can show how alternative energy can and will fuel the future. 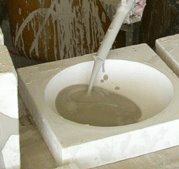 I hope to move my porcelain production there eventually. The promise of firing my kilns with solar power lifts my spirit no end. Artisanal production of all sorts will have facilities there. This all brings me to this morning's rant. I woke up to fierce winds this morning, last week a 60 degree thaw followed by a freeze and snow. The quickly shifting climatic changes happening here now, maybe at a micro level for now, make me very nervous. As an environmentalist, I am keenly aware of global warming and the danger that it poses. I have taken the stand, in my need to remain focused within the vast amount of work, change and projects that are happening in regards to shifting our world and our consciousness toward gentler living on this earth, to support art as a way out of this mess. Art and the production of local artisanal goods to satisfy our need for stuff. Revitalizing regional, smaller scale farms, reclaiming land, cleaning the water and basically learning to live in greater harmony with all that sustains us, the earth, is a vital part of my generation's work. Business as usual is no longer good enough. We need to refit our imaginations with a broader way of seeing, a broader way of listening to each other to find ways, though creative thinking and doing to find ways out of the old ways of thinking. We must change course and live as if there won't be a tommorow unless we change course. Gandi had a vision for India during the time England had colonized the country. He called it Swadeshi. This is not a new idea, but an ancient way of being, that in today's world can fire the imagination and create lives for everyone on the planet that reveal right work and social justice. This blog will act as one platform and a channel for this conversation. Please comment. Liz McIlvaine and I are doing table linens. Here's a preview. I read a blog this AM from my favorite blogger, Amy Shaw at Greenjeans, about telling the truth. Hype, spin, excitement, panic, so much of what is propelling us forward as a society is more often than not based on asssumptions, misunderstandings, and exageration. The conventional wisdom if accepted as true, boxes us into a collective understanding of what is real. This is not only unwise, it can be dangerous. Lying about a product, for instance, "its fabulous, will make you look 10 years younger!" Lying to grease the wheels, or sell a product, seems to me to stem from an inability to really face the truth, which can be brutal, but also life changing. Seth Goodin and Hugh MacLeod have been talking about lying on their blogs lately. Seth even wrote a book about it, "All Marketers are Liars". So, where does all of this lead? Well, being true to yourself, I suppose. Romantic, idealistic, sort of corny? Or is that the fear? Being hip, smart, with it, cool, popular and oh yeah, making lots of money, does that all require lots of lying? What if the new thing is telling the truth? Not exploiting others to make a buck? Can you get ahead that way? What companies, entrepreneurs, artists, etc. have succeeded by being honest? What if some traditional ideals, like honesty is the best policy, actually DO lead to long term success? Numbers don't lie, especially when you are balancing your checkbook. Knowing what you like, who you are and what kind of relationship you have with your family, friends, customers and most of all, trusting your gut, maybe will help navigate this sometimes cold, sometimes warm, sometimes cruel, but often kind world of ours. I believe most people are OK. We are all strugggling with not knowing for sure. It is hard to know what is true when you can't ever be certain. Isn't that what makes it so fun?!? I had an amazing trip into New York yesterday. 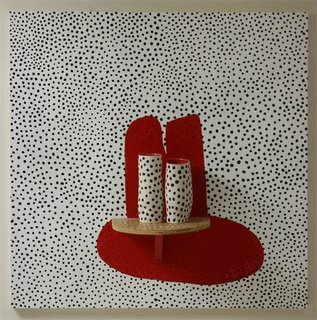 I drove down with Liz McIlvaine, textile designer and painter extraordinaire. We began our day with a visit to Toshie Otsuka, potter par excellent. Traversing through my old haunt, the meat packing district and the West Village we walked by a lot of old and new places. We made our way to Opto Design Studio, where I met with my graphic designer/web developer John Klotnia. John and Ron at Opto did my first web design and are now readying web 2.0 for me. Stay tuned! From Opto, Liz and I met at Betty Woodman's studio. I worked for Betty when I was in graduate school at SVA. She is getting ready for a big retrospective at the Met which opens in April. Liz will sew 100 bags for the museum shop via the Fabric Workshop in Philadelphia. Finally, we ended up at my dear friend and patron, Cathy Kaplan's apartment, where Cathy graciously entertained a handful of friends, showing off my tiles I installed for her this past fall. 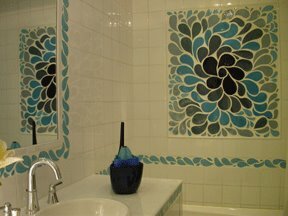 The tiles are pictured here. All and all, it was a most amazing day, full of inspiration, reconnecting with old friends. I love my life! Thank you Liz, Cathy, Toshie, Guillermo, Joanne, John and Jefferey! I am waking up each morning, now, thinking about what to blog. At this point, very few people are reading this blog, but I am still writing here everyday. I am cautioned by friends not to advertise my committment to write daily, in case I miss a day, but I am drawn to this new medium. I used to write a column for a local arts publication, but since my core daily activity is making pottery, I have to choose where to publish. For now, I have chosen to publish here. It is a far more fluid place to publish my thoughts and I can do it everyday, if I choose. So far it is a forgiving place to place my words, partly because it isn't being critiqued, yet, but I am forever hopeful. I have a feeling this new medium is similar to the invention of the printing press. Similar in its advancement of human thought, but this new medium is exponential, viral. It will catch on and impact the world far more quickly than the printing press did. Yes, I hope these entries will allow me to sell more pottery, since I don't like packing up my work, hauling it in my van to various locations, set it up and get dressed up to stand in a booth and talk to a lot of people anymore. But more than that, this form of communication is giving me the opportunity to express my thoughts and hone my thinking about my work and about being. I live in a rural environment, wildness exists outside my door. I spend my days making work that people will use. Work that contains, through the extreme temperature of the kiln, a sense of my being and the place where I work. Many mornings as I walk to the studio, I see a hawk circling in the sky seeking her next meal or just flying for the joy of it. It gives me a thrill to be in a place that supports that kind of life. It is still dark out as I write this. It is still and quiet. My day ahead will be anything but, because I am going to New York today. But I will return here tonight, and wake up tomorrow in the stillness that is a part of my life now. A stillness which gives me pause for thought and lets me be, embuing my work with a sense of both. Bespoken dinnerware is a term I started thinking about this past fall as I looked at factories or another artisan to help me produce my work. 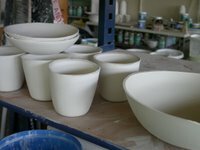 Making fine porcelain dinnerware is such a highly specific task, that in traversing around the east coast in search of a production partner, I realized the best move forward is to keep doing it myself. At right is a shot of me filling a mold with slip, a slurry of clay and water held in suspension with some magical stuff called a defloculant. The mold was originally created by me, but I have a brilliant mold maker I work with, named Robert Petro, who makes my production molds. i.e. Saville Row tailors. 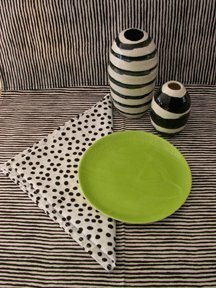 Dinnerware is made to order in specific colors and specific shapes for an individual who orders it from me, davistudio, directly. It's Saturday and I'm in the studio. I have a lot of cleaning up and cleaning out to do, New Years resolutions and all. 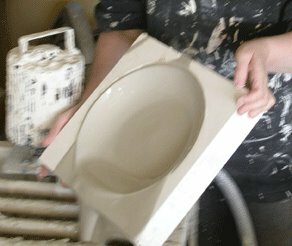 At left is a production shot of some greenware, ready to be cleaned before it goes to the next step, bisque firing. davistudio is gearing up for a different kind of year ahead. New partners like Greenjeans, old friends and in between. Making art, making pottery, getting and staying organized, being a good mom and spouse are all on my list this year. 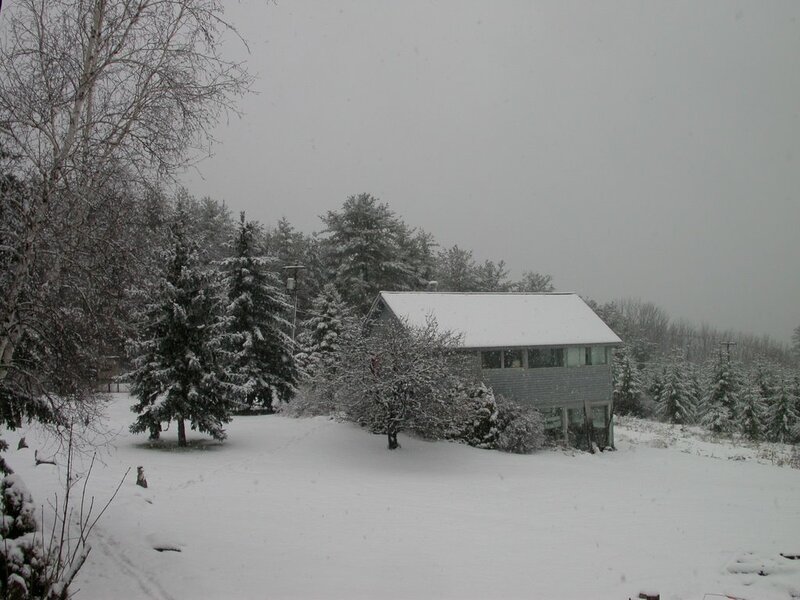 Here's a picture of the studio in this week's snow storm. It is beautiful up here in winter. One of my goals this year is to clean out and upgrade my production capacity so I can fulfill orders more promptly. So I am in the process of hauling 5 years worth of broken pottery into a dumpster parked in my driveway. I checked out several outsourcing possibilites in New York Sate and Massachusettes this fall and have decided to keep on producing the work myself. Making fine porcelain is not an easy task, which may be why the best of it tends to come from places like France, Germany, Belgium, Japan and China, places where ceramics have a much longer history than the USA. So, I will continue to plug away, refining my process and hope to be able to fill orders with a 2 week time frame. Since the vast majority of my work is made to order, 2 weeks would be a real break through for me. I basically work alone, which is also out of the box. I have started working on a spring and summer collection. The new pallette is softer than the brights I have used in the past. I hope to have new work ready to publish in a month or so. Winter is a great time to clean out, reassess and make resolutions. There is so much great stuff going on and sometimes I feel like there is too much bad news in the media. Communicating the good news has become the task of citizens. I hope to contribute to the good news here at my blog. It is thrilling to have access to technology that facilitates the telling of more of the story. 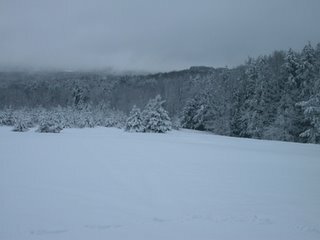 The story of a potter living and working in upstate New York.